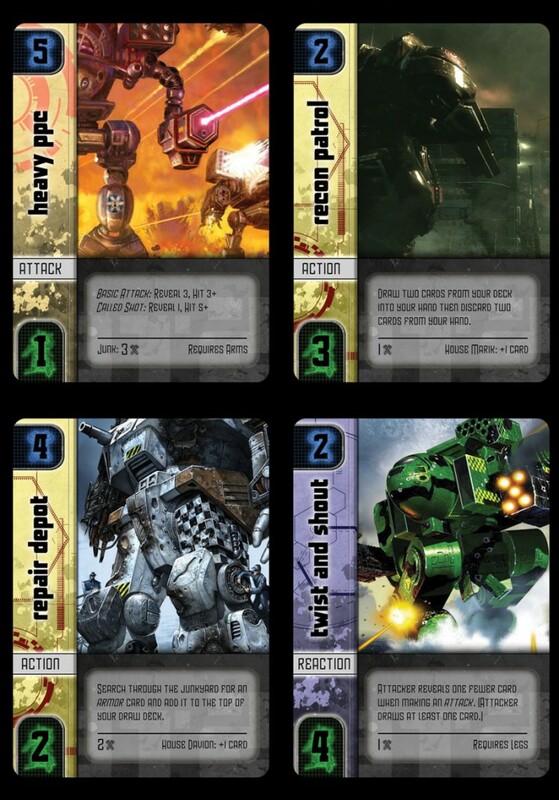 The BattleTech deckbuilding/deckfighting project came from a Twitter conversation between Daniel Perez (Highmoon Media) and Philip J. Reed (Steve Jackson Games), which was taken over to Daniel’s blog. Daniel writes,”I’d like to see the idea of deckbuilding combined with deckfighting. I mentioned it to Phil in relation to what form a BattleTech deckbuilding game would take, and he said that it might get too long, like two games in one. He’s right, considering how long a game of Dominion took to play, but I can’t shake the idea that it would be a good combination.” That’s been a thought in the back of my mind for a while now, and, wanting to expand the portfolio a bit, I decided to take on the idea of developing this type of game into a design project. So, in order to start a design project based on a game concept, one doesn’t really need to start by designing a game. Instead, come up with elements that suggest game play. So what would a deckbuilding/mechfighting game feel like? I backed off from Daniel’s original idea, where one would build a deck and then use the decks to fight it out, mainly because one would need two sets of icons on the cards — one for the building part of the game and one for the fighting part. That, and the two phases of the game, really made me feel that you’d only use half of the card for one phase and the other half for the next. Instead, why not do the deckbuilding and the mechfighting at the same time? First, you have a ‘Mech with Armor cards on the four main sections of the ‘Mech: head, torso, arms, and legs. When your ‘Mech takes damage, it loses armor cards from locations. Lose all the armor in the arms or legs and you can’t use cards that require that location. Lose all the armor in the torso or head, and you are out of the game. Secondly, the Attack cards use a neat game mechanic from a fun single-player print-and-play game called The Island of D 2: The Shadow of Dawn. In IoD2, the cards are multi-purpose. You draw a card and on it are abilities, random numbers, and monsters (with rewards). Trying to overcome a task? You can play a card from your hand, then draw a card and add the random number. The neat thing is the random numbers on the cards are inversely proportionate to the strength (and loot) of the monsters. If you keep high-ranking cards in your hand, you’re facing monsters with a low reward; keep low-ranking cards in your hand and you might not be strong enough to defeat the big money monsters. In the BattleTech game, the attack resolution is similar to IoD2: your Attack card would tell you to reveal a certain number of cards from your deck, which would go into your discard pile. The Heavy PPC card that appears below says to reveal 3 cards, and cards with attack values of 3 or higher are hits. (This also is similar to how my World War 2 hack of Philip J. Reed’s vsM Engine works.) The tricky part is the cards with high values (the green values in the lower left) are going to be Armor cards, which go out of your hand onto your ‘Mechs, or cards that simply aren’t that useful. Attack cards and really beneficial cards that you really want in your deck have low values. The intent is during play, you would want to straddle that balance between having a better chance to hit your opponent and having beneficial cards in one’s deck. You might decide to load up on a bunch of wimpy cards, so when you finally get those Attack cards in your hand, you can make sure you’re going to hit. Meanwhile, your opponent is firing a lot of stuff at you and hitting every so often. This game is a bit of a Dominion clone for the deckbuilding aspect: Starting hands would contain Dropships or Technicians, which have your standard 1 coin buy. Here, in BattleTech DMG, you have wrench icons you can use to add a card to your discard pile: Twist and Shout costs 2, while Heavy PPC costs 5. If you have a card in your hand, and play it, you follow the text on the card above the line. For instance, Recon Patrol has you draw cards into your hand, then discard some that you don’t want. There is a secondary effect for this card: if you are allied with House Marik, you then draw one additional card. Or, instead of playing the card as written, you may discard the card and gain the number of wrenches below the line. Discard Recon Patrol and gain 1 wrench for the “Buy” phase. (You can Junk — which to Dominion players is “trash” — the Heavy PPC to gain 3 wrenches. The way the Attack card above would work is you can decide to make a Called Shot or a Basic Attack. The Basic Attack has you revealing the next three cards, and counting anything that is a 3 or more as a hit. The defender has to remove that many points of Armor cards from their ‘Mech, from whatever location they wish. (Some Armor cards would have more than one point of armor.) The Called Shot functions similarly, but you just reveal one card and if it is a 5 or better, it is a hit. On a Called Shot, you decide which Armor card is removed. That’s the basic idea of the game. Just enough (actually, more than enough) information to build a design around the card game. The next step was to find some hi-res BattleTech images online and start making with the goodness. And there we go, another design piece in the portfolio. Have you looked at Nightfall (which is heavily M:tG inspired) and Thunderstone? Thunderstone also does the dual purpose card – an adventurer also has a coin value, a defeated monster is worth VP’s, and also money, etc. Also, thanks to Androminion on the Android, my Dominion games now last between 2 and 7 minutes, tops. 😉 It actually made me start to rethink Dominion as a game – the AI typically buys at most 5-6 cards that aren’t money or VPs, and will smash you if you don’t play the same. As much as I love Dominion, playing it that way makes me a little sad, as so few of the interesting mechanics get used. I sort of want to rejigger prices to make buying cards a more optimal choice than money in a lot of cases…. Hey Derek, thanks for the comments! Yes, I have looked at Nightfall, in fact, I was on the graphic design team. You can see some of my earlier designs for Nightfall’s cards in the banner atop the home page and in the gallery. Oh, and I sort of want to spend way to much time actually putting together a real BattleTech DMG. Please, let’s call Catalyst NAO and get this done. Like, for Gen Con next week! I fricking love this. If we need a stable of playtesters, we stand ready. EndGame has run several group play tests for prototype games…and we are also huge BT fans. If you think it would help you get some traction for helping to sell the design to Catalyst, let us know. I am curious to know the status of this idea. I too am a big Battletech fan and would be willing to playtest or help design such a game. My local friendly game store has several people who are also big Battletech fans and I am sure we could get some of those people involved in this if desired. This store has done playtesting for FRED Distribution and Eagle Games. Please contact me at the email provided if any of this is desireable to you.